Operation PLUNDER, crossing the Rhine. Battle Honour RHINE on the Queen's Colours. The Battle Honour RHINE is emblazoned on the Queen's Colours of The Royal Irish Regiment. Operation VARSITY was Operation PLUNDER's supporting airborne operation. The 1st (Airborne) Battalion The Royal Ulster Rifles was given three tasks - seize the bridge over the river Issel east of Hamminkeln, seize the level-crossing and station, and prevent enemy penetration from the south-east. Intelligence reports stated that the landing areas were occupied by enemy artillery and infantry units with elements of a Panzer Division held in reserve several miles to the east. D Company was to land on LZ U1 and seize the Issel bridge by a coup-de-main, A Company was to land on LZ U2 and seize the level-crossing and station area, and the remainder of the Battalion was to land on LZ U3 and concentrate in positions known as Area X. From there the latter would move cross-country to a dispersal point known as Y and consolidate the occupation of the Battalion's defensive location, including the objectives already taken by A and D Companies. The landings on all three LZs were due to start at 1020 hours on 24 March 1945. Gliders in a field outside Hamminkeln during airborne landings east of the Rhine (left). D Company landed on LZ U1 as close as possible to the bridge. The first glider, carrying the Company Commander (Maj Dyball), landed at 1025 hours and crashed 150 yards from the bridge. Those in the front were thrown out through the nose and those in the back managed to get out through the door, coming under effective enemy machine-gun fire which killed the wireless operator and destroyed his radio. On landing, a wing had ploughed a trench for the seven men who, hastily occupying it, brought a Bren gun into action and silenced the enemy machine gun. Another enemy machine gun opened fire and, under cover of the Bren gun, Dyball sprinted across open ground to a small wood where he made contact with two glider pilots, two infantrymen from 2nd Ox and Bucks and some Royal Engineers. They provided, in the absence of Dyball's platoons, a fire support team as he moved with his HQ personnel to clear the wood. Having killed two enemy, he then arrived at a position where a trench ran towards the German occupied house and bridge. When a small group of enemy advanced towards them along the trench, a grenade was thrown. It was a 20-yard throw and did not land in the trench but exploded beside it; despite this, the enemy raised their hands in surrender. When Major Dyball moved down the trench with his group and arrived at the house, Number 1 Platoon appeared, having already cleared the house and captured 25 prisoners. His Number 2 Platoon also appeared, having achieved its house clearance tasks. The bridge was now D Company's and Dyball quickly organized his all-round defence to hold it against any counter attack. The D Company mission to capture the bridge, although planned for four platoons, was instead achieved by two platoons, with the assistance of a few from Company HQ, some glider pilots, Royal Engineers, and three infantrymen from the Ox and Bucks. 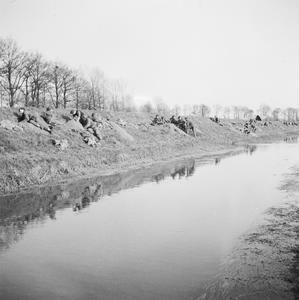 1 RUR digging in on the banks of the River Issel after landing (right). A Company, whose task was to seize the level crossing and station, was due to land on LZ U2. Unfortunately, only two of the company gliders succeeded in landing in the correct place. These carried the platoons commanded by Lieutenants Laird and Stewart. Both platoons moved off to their objectives and found that there was no organized resistance on the level crossing, although 20 mm guns were firing into the area from the direction of Hamminkeln. One platoon of 12 Devons was in position about 100 yards west of the railway, where it had found fifty-two German soldiers quietly awaiting capture in a large barn. Lieutenant Laird then organized the defence of the level crossing with the three platoons available. Shortly afterwards, Support Company HQ and two machine-guns arrived from the north, but there was still no sign of the other platoons of A Company or of the remainder of the Battalion. As in the case of D Company, no enemy counter-attack was launched against the location. About 20 minutes after occupying the area, three enemy Self-Propelled (SP) guns emerged from Hamminkeln, drove over the level crossing and across the Issel bridge, disappearing to the east. The prisoners, who now numbered nearly 100, were held in the railway station, guarded by glider pilots. Contact was made with D Company on the bridge, and the realization that both Battalion objectives had been taken raised morale. Meanwhile, the rest of the Battalion was landing on LZ U3. When Captain Rigby's glider landed at approximately 1030 hours he found that houses in the concentration area were occupied by some 150 Germans who had probably been using them as billets. There was a fair volume of fire from all directions and as his glider was within 80 yards of the Germans, and fairly badly damaged on landing, he did not attempt to unload the jeep but got everyone into a ditch to the side of the road. Between his position and the houses, one of C Company's gliders was burning with ammunition exploding. Several minutes later the surviving occupants of the glider came across the open ground towards them from the direction of the houses. They reported that when they had crash-landed the glider had caught fire. Having got out alive they had moved towards the houses, but, having met considerable opposition, had been forced to turn back. Another platoon from C Company had arrived from the south and was also in the ditch firing at the German occupied houses. Then a third platoon from C Company and one platoon from B Company arrived with about twelve prisoners from the houses on the west side of the road. One or two from B Company Headquarters were also there, but the Company Commander, Major Donnelly, had been killed. As this appeared to be the sum total of the Battalion which had landed so far on this LZ, Captain Rigby decided to leave a small fire group in the ditch and move round to the right and attack through the orchard. Just as he was about to move he saw another platoon of B Company (Lieutenant O'Hara-Murray's) starting to move through the orchard. He therefore ordered 2-inch mortar smoke to be fired and then attacked the houses. His attack went in at right angles to Lieutenant O'Hara-Murray's platoon. Enemy fire was spasmodic, and the Germans offered a very half-hearted defence. Most of the Germans threw their weapons away when the platoons got to within 40 or 50 yards. The Riflemen killed quite a number of Germans using their grenades and Sten guns in and around the houses and barns and in 15 to 20 minutes all enemy had been rooted-out and the area cleared. Captain Rigby then sent B and C Companies to the positions laid down in the original Battalion plan and directed the glider pilots to take charge of some 100 enemy prisoners. Around 1115 hours he established wireless communication with D Company and was informed that it was on the bridge. Unable to get in touch with A Company, he decided to wait until noon in case any more of the Battalion should arrive. Shortly afterwards, two six-pounder anti-tank guns and some MMG personnel turned up. The machine-gun teams were sent to C Company and the two six-pounders took up positions to cover the road running south from Hamminkeln. They had only been in position several minutes when they engaged and destroyed two armoured cars approaching from the south. Captain Rigby decided to move off the LZ at 1215 hours and moved along the original Battalion route to the dispersal point. From there B and C companies moved to the positions given in the original plan. As there was also no sign of the Recce Platoon, one platoon from C Company assumed left flank guard and one platoon rear guard, with the two anti-tank guns moving in bounds on the left flank. The right flank was by now safe as American gliders were landing off to the immediate right during this move. Lieutenant Wright joined the column en route, and the party also met platoons from the Ox and Bucks. On arriving at the railway, it found Major Liddle with a platoon of A Company, and the MMGs, on the level-crossing. Battalion HQ was established in the wood southwest of the level-crossing, with B Company, C Company, and the supporting weapons consolidating in their planned positions. 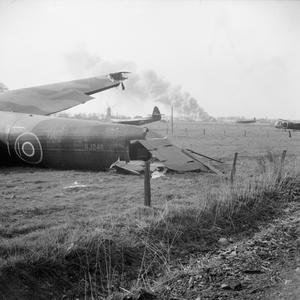 A Company was relieved by Major Jackson's Glider Pilot Squadron in the area around the station and level-crossing and moved to cover the exits from Hamminkeln. A number of wounded, including the Commanding Officer, Lieutenant-Colonel Carson (whose glider had literally broken in two on landing), had been moved into a house beside the railway where they were treated by a captured German medical officer (doctor). The wounded were later evacuated to the Main Dressing Station once it had been established in the Battalion area. By 1430 hours, the fighting had died down and the Battalion was firmly established on its objectives. Many of the groups that had landed outside the Battalion area succeeded in rejoining during the afternoon, including Major Rickcord's (who then assumed command of the Battalion). Almost without exception, these parties had had to fight their way back to the Battalion area, some over considerable distances. 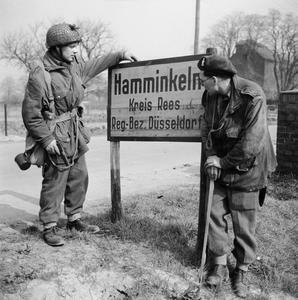 Studying a sign outside Hamminkeln (left). The 1st (Airborne) Battalion The Royal Ulster Rifles casualty total was 16 officers and 243 other ranks. The success of the airborne landings was undoubted, and overall had a disastrous effect upon the enemy's efforts to prevent the enlargement of the Allied bridgehead on the East bank of the River Rhine. Enemy resistance, hitherto considerable, collapsed in dramatic fashion with the landing of the leading aircraft carrying the airborne force. During the rest of the 24 March, there was little enemy artillery activity, but two or three SP guns appeared, and fighter air support was tasked to assist. Enemy troops were still holding the houses on the East of the bridge, and there were armoured elements moving in Ringenburg and the nearby woods. Prisoners of war still continued to be collected, and by nightfall there were 650 in the Brigade's POW cage -a very large number of them having been taken by 1 RUR. The Royal Ulster Rifles was awarded the distinction RHINE which has been carried forward on The Queen's Colours of The Royal Irish Regiment.